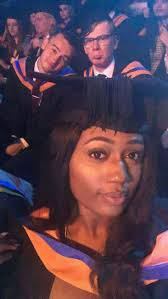 Yemisi Yekini, the daughter of the late Nigerian football player, Rashidi Yekini has graduated with distinction in cinematography from a university in the United Kingdom. The pretty lady graduated with distinction in cinematography from the De Montfort University in Leicester. Yekini was also awarded the second overall best cinematography student to graduate from the university. Yemisi’s father Rashidi Yekini who was a professional Nigerian football player died on May 4, 2012. Yekini scored thirty-seven goals during his career as a Nigerian international player. Yemisi, the first daughter of the late goal-king who read Cinematography in the prestigious UK varsity was a cynosure of all eyes during the graduation ceremony according to the legal counsel to the late Yekini, Barrister Jubril Mohammed Olanrewaju, who witnessed the event. The highly elated Yemisi however said she is not ready to put her training into action by storming the fast growing Nigerian film Industry. She stated that she wanted to further her studies by pursuing her Master degree in the same field. Yemisi’s mother Pat Mariam Fabode and her step dad Oladipo Fabode were also at the graduation ceremony held in UK. The legal counsel also informed that Mariam, Yekini’s second daughter is also doing very well at the University of Ilorin where she is reading English and presently at 200 level. “Part of the objectives of Rashidi Yekini Foundation is to ensure that the children Yekini left behind get good and quality education,” Olanrewaju who is the CEO of the Foundation stated.